Hello Friends!! I hope that everyone is enjoying the Holiday season! My family, like many of yours I'm sure...has and will be really busy for the next week. We just celebrated Christmas at our house with family, next week we celebrate both New Years, and a Birthday, and the following week another birthday...LOL. We get lots of family get together time, at this time of year! Well, it is my turn for a tutorial, and we just had our first snow (that counts..lol), and it took me 2 hours to drive home from work. I already find myself thinking of spring! Here is a Ribbon Rose Pin Tutorial that I created using some fabulous Ribbons and Trims from Really Reasonable Ribbon!! Hello Friends!! Today I would like to share with you another one of my painted projects. This is one of MANY sleds that I purchased many years ago....and finally gave it a quick paint job. The one thing that has always bothered me about the sleds, were how plain the sides would look. I could of added more painting to the side but the wood is ruff on the sides...and I don't like to ruin my brushes. I am all proud of myself...because I am happy with how my sled turned out!! Don't forget to link up your Anything Goes and Ribbon Creations to our challenge!! For those of you new to blogging...I have two new "blogger" tutorials (I have other blogging tutorials as well) How to center your blog header and How to add a "Pin it" button to your blog post Thank you for visiting today!! Hugs Heather!! Today I am doing another "Two in One" Post. It is Week 42 at Sugar Creek Hollow...and we have an Excellent Challenge for you this week!! We would love to see you create Gift Boxes, Gift Bags or Enclosures in a Vintage or Shabby Chic style. This ties in so well with the "Anything goes and Ribbon challenge" that starts today at Really Reasonable Ribbon. So I thought instead of two posts...I would do one. I just love the little Christmas Gift bag that I created below! It is Vintage, Shabby and for one of my favorite online Peeps! Actually I call her my BOLB (bestest on line buddy). She knows who she is...so I don't have to mention that...LOL. I was trying to think of what to make her...and I was SOOO happy when she "Sticky Noted" my Mitten Ornament....so I took it out of my etsy shop..and will be sticking it in this little gift bag :0). There are so many goodies on this little creation that I want to share with you! 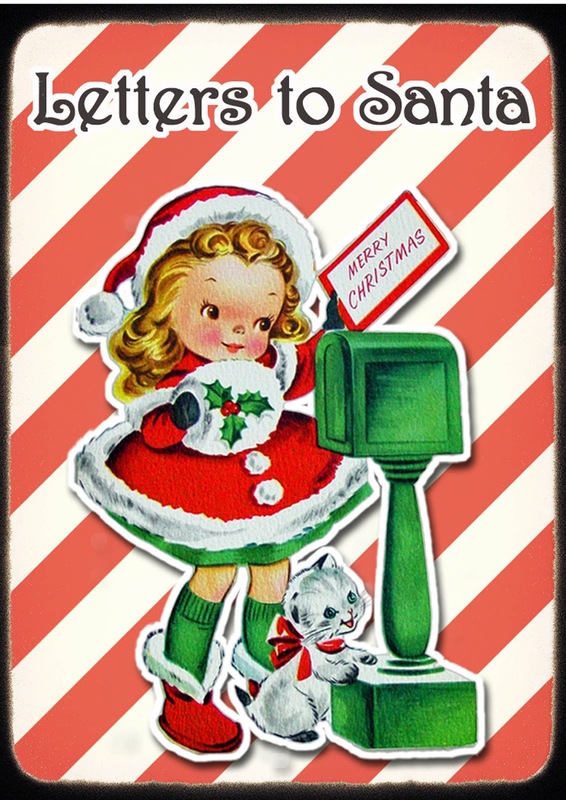 Lets start out with the fabulous vintage post card from Gecko Galz!! 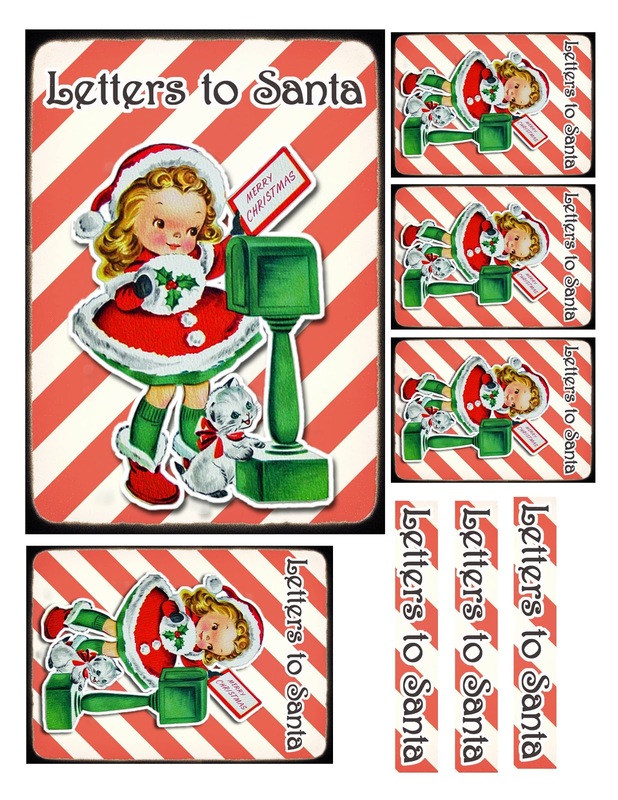 I just LOVE this month's sets of vintage post cards...Leanne really out did herself this month!! I used one of the digital papers from last month's digital paper pack, to create my little text boxes. I used a lot of goodies from Really Reasonable Ribbon!! Bonnie has the shabbiest ribbon assortment out this month!! I used the Pink and white polka dot ribbon and aqua diamond from the December KOTM as well as the white pom pom trim and chocolate & marshmallow candi and candi foam dots. The chocolate & marshmallow candies look like little brads....I LOVE them!! Here you can see the sweet little text boxes I made with the Gecko Galz Digi Paper and vintage post card image. I started off with a big bitty pink polka dot bag from RRR, used some more candi and candi foam pads, and score tape to adhere everything together. I embellished with my hand painted holly leaves, and moss green jute trim and May Arts moss green leaves trims all from RRR. I inked all my edges with Ranger's Vintage photo distress inks. I used a couple stamps from Gecko galz "Garden Mandela acrylic stamp set" a random pattern of snowflakes on the bag. You can see one of them located at the center bottom of the bag below. I used more ribbon from this months assortment, and some fushia curly ribbon and peppermint baker's twine as well as pink leaves all from RRR. I also created a few ornaments for my tree. I started out with some cut out shapes, painted them pink and then added some roses! I used the fushia curly ribbon and new coral double faced satin ribbons to add some shabbiness to my Ornaments!! Well....I hope that one of these creations inspires you to come and play along at Sugar Creek Hollow or Really Reasonable Ribbon this week!! Not only that ...if you use a Gecko Galz image or one from one of my collage sheets...you can take part in MY Challenge here...for a chance to win a $25.00 Gift Certificate to Gecko Galz!! Also I want to let you know that we have a Guest Designer at SCH this week ....Jytte and it would be so sweet of you to stop by her blog and leave her some love! Sugar Creek Hollow will be taking a break for the Holiday season, so this will be our last challenge of the year! We will start back up on Saturday January 5th!! I will be playing along in some challenges too!! Here is a photo of it below!! I just love the soft and yummy colors!! I thought I would do something a little different this month. I found one of my mitten cut outs, painted it a shabby pink, then added a pink rose and some hydrangea. Here is a close up of the fabulous ribbons from RRR. I used the cotton candy baker's twine to top off my ornie and dress up my antique button. The cream seam binding, Juliet Lace, Pink and Aqua ribbons from the assortment for my mitten cuff. It looks like a yummy cookie. You may of noticed that the last couple posts, my creations have reminded me of cookies....LOL. I am going on my One year anniversary of being Vegan, and I miss all the Christmas cookie baking! Here is a close up of the simple stroke rose, rosebud, leaves and hydrangea. The back is painted a darker pink and I left it plain, so that I can sign it. The Juliet lace and pink ribbon with polka dots do show up on the back. This Ornament is available for purchase in my Etsy store, unless my mother comes over and claims it...LOL. 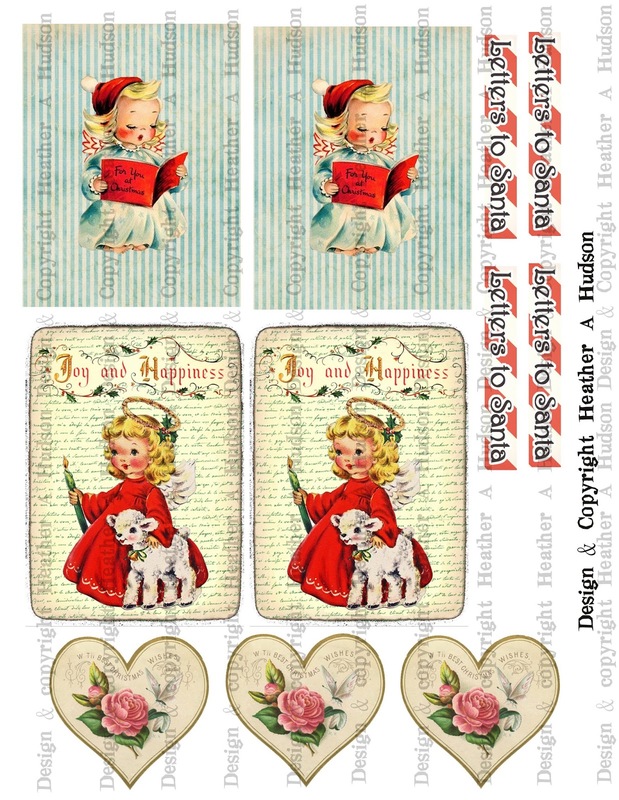 It is week 41 at Sugar Creek Hollow and this week our challenge is for you to use a stencil or mask in your Vintage or Shabby chic style creation. I used a snowflake stencil, and some pink paint to add the snowflakes to my background. Of course, I ended up covering up most of them. I used my favorite spellbinders die, and vintage photo and barn door distress inks. The Peppermint and Holly, are images that I painted in GIMP. Then used my Black cat cougar to cut out. I used some fabby vintage looking pink netting and peppermint baker's twine from Really Reasonable Ribbon. I can't wait to see what you come up!! So get get those masks and stencils out and get creating, and come link up with us at Sugar Creek Hollow!! Hello Friends!! I hope everyone is enjoying getting ready for the Holidays! All I know is that, November 30th I was ahead of schedule, and all of a sudden I find myself behind schedule...LOL. I would like to share with you a "Snack Sack" that I created. I thought this would be great to put a couple cookies, or candies in for a friend. Then I thought maybe...just maybe if I accidentally left this at Ginny's, my BFF, she would fill it with a couple of my favorite oatmeal cookie sandwiches. We have this thing about not returning bowls (hopefully gift bags will be included in this) empty...LOL. "$25 Gecko Galz Shopping Spree Give Away"
Digital Collage sets, Digital stamps or Digital Paper packs from Gecko Galz. First....a look at something I created using the "Jesus is the Reason" Collage sheet I made. I only used two different images to create this piece, but it took 36 layers...LOL. Here is the original image below. I changed the wings of the left Angel, added more flowers cascading, and a lot of space to add my sentiment. I also added a vintage star with rays. You can see some of the differences in the photo below. I added some Champagne pearls, and a golden rosette from my stash, I also applied clear glitter to the edges of my ornament, angel's wings and baby Jesus's halo. Now I need to show you the back. I used a scrap of patterned paper, and glued it to the back of my image, then I cut it out...much easier that way...LOL. Then I added the Baby in the Manger image. Here are some close ups. Now a look at the bottom!! Hopefully my tag will get you inspired to create something for my challenge!! How would you like a chance to win?? 2. You may only link up your creation to my challenge and other NON Gecko Galz Challenges. (sorry no linking up to other Gecko DT member's challenges with this creation, but feel free to link up to any other challenges). 3. You can use any Gecko Galz Collage sheet image or an image from a Collage sheet I have made. 4. You will have till 11:59pm January 6th to link up! I will chose a winner using Random.org for the Gecko Galz Shopping Spree. Collage sheets of their choice from my Etsy. Make sure you stop by Helene's blog to participate in her give away!! It is the first of the month and a Saturday. So I have two different challenges to share with you. I thought of doing different posts, but then decided it would be easier to just do the one. I also have another challenge on Sunday. It is week 40 at Sugar Creek Hollow, and we would like to see you create a Vintage or Shabby Chic Creation with some DISTRESSING!! I just love Distressing!! 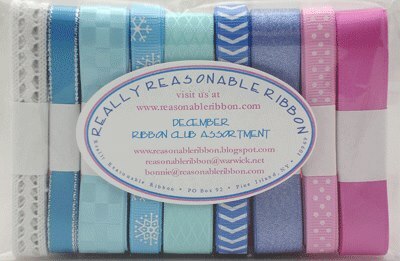 I decided to participate in the first challenge of the month at Really Reasonable Ribbon, starting today too. We would like to see you use White on White with one additional color and ribbon. Luckily for me, I had an idea that was going to work for both challenges!! Here it is below. I created my own template in Inkscape. Traced it onto some cardboard from an old box in the basement, cut it out, added some white paint, and distressed the edges with Ranger's Vintage Photo. I even removed some of the first layer of cardboard to expose the corrugated part. I just LOVE how it turned out! At the top I have a darling little beaded stick pin that I threw together and vintage button. You can see where I did some distressing on the "Merry Christmas" and added a little glitter as well. I love the White organza ribbon above as well as the white ric rac, white pom pom trim, white leaves trim and white seam binding all from Really Reasonable Ribbon below. 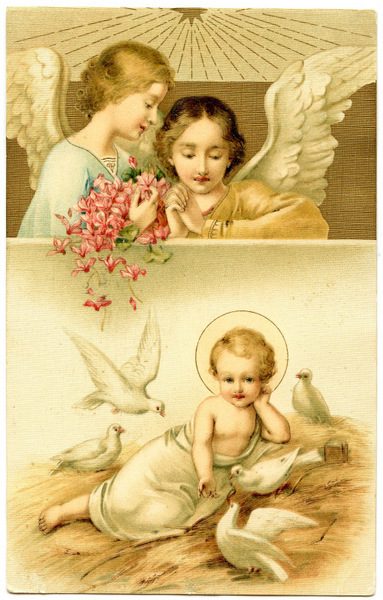 I am sure that you are all in "Christmas Card and Gifts Mode" just like I am. Hopefully you will be able to fit something that you need to create, into these challenges. You don't have to do both challenges together. Feel free to do them separately!! Who knows how many things you can get done and "checked off your list!" Don't forget to check back tomorrow! !